In the global debate on climate, the sceptic workload is carried by individuals working from kitchen tables or their equivalent. Yet, despite their meagre resourcing, top sceptic bloggers achieve an avid readership. In Australia, both major political parties chant the mantra of dangerous, human-caused global warming. No newspaper is avowedly sceptic, although the News Corp press, unlike its Fairfax counterpart, permits dissenting voices to grace its pages and websites. Yet despite the overwhelming bias in favour of warmism, especially at the ABC, 47% of the population rejects the mantra: I suspect the bloggers’ message has percolated through. Of course, News Corp columnists, including the Herald Sun’s Andrew Bolt and Tim Blair of the Daily Telegraph are sceptics, each well-paid and both with massive followings. But they don’t specialise in climate coverage, and a lot of their sceptic items are extracted from the writings of the kitchen-table climate bloggers, who keep close watch on emerging science and controversies. Here are some 2014 “Bloggies” award results for blogs which happen to be sceptic. Best European Weblog: Roger Tattersall’s Tallbloke’s Talkshop (UK). Anthony Watts, of Watts Up, also won the top blog award in 2013. He has achieved 195 million page views since launching the site. In 2011, 2012 and 2013 his blog took first place in the Bloggies Best Science Weblog category. He is on no-one’s payroll, and gets by with half a dozen volunteer moderators. He earns some income from Amazon book referrals and wordpress.com blog ads, donations via a tip button and the sale of mugs, T-shirts etc. He normally takes no directly placed paid ads. In 2012, he received $US44,000 from a donor via the Heartland Institute think-tank to make official climate data more user-friendly. He gets small honorariums and expenses as a Heartland conference speaker. Joanne Nova earlier was rated best Australasian blog in 2012. She is blogging full-time while raising a family at a modest outer-suburban Perth home, sans government grants, sans academic salary andsans cheques from Big Oil. Her Climate Sceptics’ Handbook has achieved 220,000 downloads and been translated into 16 languages, but she distributes it free. Nova’s blog attracted half a million visits last year, but in March of 2014 she wrote, “Our bank account is looking very low. All contributions would be gratefully received. Thanks.” An individual known only as “Jaymez” then offered to add $1 to every $4 raised, to a maximum grant of $5000. In the event, she got $20,000 that week from 600 donors globally and $5000 in Jaymez’s matching money. (Oddly, donations take the form of buying her $1 e-chocolate bars, as she’s not a registered charity). This donations drive was a unique occasion, as Nova’s normal income is derived from small-change tip-jar contributions and minor web ads and sundries, such as commissioned reports. Nova’s real name is Joanne Codling, and she’s married to scientist Dr David Evans. She tellsQuadrant Online, “This battle for logic and reason has cost us thousands, most of it in opportunity cost of what we could have earned. We’d be a lot richer now if we had not got involved in this climate debate. But it has opened some excellent doors and we have friends all over the world. As far as mental stimulation goes, it does not get better than taking on the UN and Western governments with nothing but the web and our wits. I love what I do. “We need truly independent auditors and investigators — funded directly by the people, not via tax payments. I have a vision where a lot of good people make small monthly donations to the pool of people at the front line. If bloggers and writers can keep taxes lower by 2% to 3%, the donors will be financially better off as well, and this applies to corporations too. “We need to think big. We can create a permanent industry of people holding the government, and the media, to the task. If we pay bloggers well, there will be serious competition among bloggers, and a new career path for the top independent minds out of school and university. Wouldn’t that be brilliant! When invited in January to address the Climate Change Committee of the House of Commons about her five years of research into the IPCC, she had to pay for her own trans-Atlantic flights and sundry costs, with the exception of one night in a hotel, which was covered. Unlike academics and employees, she had no-one reimbursing her costs. 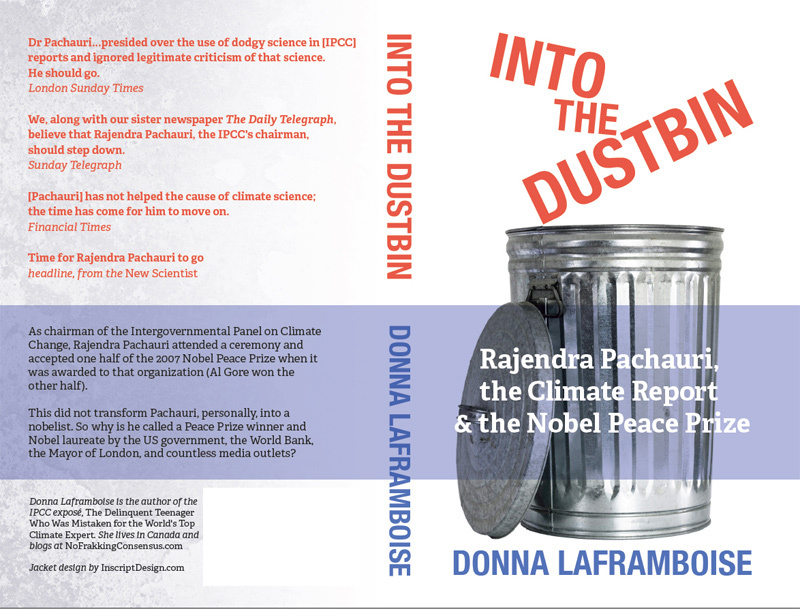 Laframboise in 2011 published her book-length expose of the Intergovernmental Panel on Climate Change, “The Delinquent Teenager Who Was Mistaken for the World’s Top Climate Expert“, which shattered dozens of shibboleths about the internal probity of the IPCC. She took the trouble to check, for example, the oft-repeated claim of IPCC chair Rajendra Pachauri that all IPCC science was gold-standard, peer-reviewed work. She and dozens of volunteer helpers combed through the 18,351 citations in the 2007 IPCC report and found that 5587, or some 30%, involved government reports, tracts by lobby groups, press releases and even “version one of a draft”. Not one of thousands of in-the-know IPCC scientists had ever sought to correct Pachauri’s misleading claim to legislators about using only peer-reviewed sources. The Australian edition sells for $A30 on Amazon or $US8 kindle. Her second e-book, Into the Dustbin, about Pachauri himself, sells for $A8.50. Her blog has exposed many snafus in IPCC affairs, such as bogus claims by scores of IPCC authors to personal Nobel Prize status. “It seems no matter what rock I turn over, a scandal lurks beneath,” she says. UK sceptic Roger Tattersall writes the 2014 Top European Blog, Tallbloke’s Talkshop, assisted by Tim Channon, who is in his 60s. Tattersall is an engineer and graduate with a specialization in the history and philosophy of science. In a near-fatal accident eight years ago a hit-and-run driver collided with his motorbike, breaking Tattersall’s spine when he was flung into a tree and forcing him to abandon his IT business. His health has largely recovered and he can manage part-time work at the University of Leeds. “I survive on a pittance,” he tells Quadrant Online. “I’ve never received any payment for anything related to my work in the climate debate,” he continues. “After I helped organise a climate conference in Lisbon under EU auspices, the EU bureaucracy refused to pay the hotel and travel expenses they promised me because one leg of my four-leg flight receipts was missing.” Tattersall pays blog-site provider WordPress NOT to have advertising on his website, a luxury he can afford because of ‘tip’ money from readers. He achieved mainstream publicity when police seized his computers during their investigation in December, 2011, into the second Climategate email release. No charges were laid. Anthony Watts received several hundred dollars for projects, and Joanne Nova got a similar amount to help fix an IT emergency on her site. To someone like WA University’s Stephan Lewandowsky, who got $1.7m in government grants for ludicrous topics (such as the “psychopathology” of climate “deniers”), these hundred-dollar pittances must seem laughable, but they’re the coin in which sceptic bloggers generally deal. Another cash-poor but globally respected sceptic blogger is Bob Tisdale, among the few outside the warmist monolith able to re-analyse and critique technical aspects of the official climate models and ocean-temperature couplings with the atmosphere. He wrote last January on his Climate Observations blog, “I’m a pensioner, a retiree, or I had been. Sales of my ebooks and the occasional tip/donation have helped to pay the bills, but they haven’t covered them. So I’ve been forced to find another source of income. I have been spending 8-to-16 hours per day blogging, writing books and producing videos over the past few years, so my new focus will obviously cut into my time for climate-change research and reporting. In his spare time Tisdale has this year written a series of posts about the now-floundering El Nino effect, which earlier in the year alarmists proclaimed would be bigger-than-big and, inevitably, due to man-made greenhouse gases. With the cross posts at Anthony Watts’ site, that series helped explain the mysteries of El Niño processes to lay readers. Marc Morano runs sceptic information compiler ClimateDepot.com, based in Washington DC, with one assistant. He is amused that the eco-magazine Grist named him as one of the top five“criminals against humanity, against planet Earth itself”. His operation is funded by the Committee for a Constructive Tomorrow (CFACT) which, in turn, is funded mainly by US private citizens. In 2011, CFACT had $US3 million revenue, and 15 employees. It paid Morano $US150,000 for full-time work running Climate Depot, making him one of a handful of sceptic bloggers to earn a comfortable living. CFACT declined to provide more up-to-date financials, but it seems a fairly modest organization – its other 14 workers incomes average $US44,000. Morano was formerly communications adviser to Senator James Inhofe (Republican, Oklahoma), a long-time campaigner against warmism. A formidable debunker of warmist literature, Morano enjoys taking on prominent alarmists in live debates, which he posts on Climate Depot in a ‘you be the judge’ exercise. In the UK, the big climate-sceptic think-tank is the Global Warming Policy Foundation (GWPF), with social anthropologist Dr Benny Peiser as its director and no more than a staff member or two. It is, or was, housed in one room. Peiser’s interests have ranged from ancient sport to asteroids: a 10km asteroid, Minor Planet (7107) Peiser, was named in his honour by the International Astronomical Union. In its first year, 2009-10, GWPF had donor income of 503,000 pounds, falling to 158,000 pounds in 2010-11. It claims to be ‘open-minded’ about the climate debate, and says its members’ views range from support for the IPCC to outright scepticism. Its focus professes to be climate policies and their socio-economic impacts; it disparages climate models and the grandiosity of 100-year climate predictions. Its main and stated goal is to generate sensible and misinformation-free debate in the media, public and political process. The GWPF board includes four lords, led by chair Nigel Lawson, an ex-chancellor of the exchequer. The other board members are two knights, one baroness and a bishop. Lawson claims GWPF has succeeded in opening the media to the climate debate, with only the BBC now viewing the science as settled and beyond the bounds of legitimate debate. The GWPF academic advisory board is chaired by former OECD top economist David Henderson, and includes luminaries such as Princeton theoretical physicist Freeman Dyson, and economist Samuel Brittan. While The Guardian and its allies hyperventilated at the effrontery of billionaire donor Hintze, another hedge-fund billionaire, Jeremy Grantham, donated 24 million pounds to set up two orthodox climate-change institutes in London, including the Grantham Institute. A year ago, Bob Ward, policy chief at Grantham Institute chaired by Lord Stern (of the infamous Stern Report), tried to get the GWPF shut down by formally complaining to the Charities Commission that GWPF was issuing misleading and politicized statements. The complaint seems to have failed, as GWPF continues. Ward has not complained about misleading by warmism-inclined charities such as Greenpeace and Oxfam. On an individual basis, sceptic Queensland-based Professor Rob Carter was outed for receiving $US1667 per month from sceptic Heartland Institute in 2012 to work on a project, theNongovernmental International Panel on Climate Change. That’s just $US20,000 a year. The Australian Labor government paid Professor Tim Flannery $A180,000 a year for three days’ part-time work a week heading its Climate Commission. When the Abbott government axed the Commission last September, Flannery took an unpaid position with the private Climate Council, crowd-funded to the tune of more than $1m. After six months, Flannery and his fellow councilors switched to paid work there (amount undisclosed). Soon after, the Council ran appeals for more crowd funding to replenish its treasury. Flannery believes the sceptic case is being pushed by “big vested interests”, with the fossil-fuel industry “pulling out all the stops now to turn the tide back.” He is also on top of the fee range at theClaxton Speakers Bank, meaning $15,000-plus per speech. He was wont to charge $US50,000 to speak to US corporations, making him Australia’s top-charging speaker. If the planet really is in such dire peril, surely he would not be charging people so much to say so? Again, and bearing sceptic Bob Carter’s $US20,000 a year in mind, let’s look at Canadian planet-saving guru David Suzuki. Details have leaked about his contract to speak to a small Canadian college (1600 students) in October, 2012 . His topics included the need for cutting back on personal consumption. Suzuki slugged the college $C30,000 (plus an amazing $C11,640 costs) to tell students that “money isn’t what matters, money is not what makes him happy.” Half Canadians in 2012 earned less than $C30,000 a year). Suzuki wants sceptic politicians to face charges of criminality. It is tempting to label that comment a cheap lie, but it isn’t. Unlike the sceptic community’s kitchen-table climate bloggers, nothing about the leading warmist mouthpieces comes cheap. This entry was posted in Climate Unfrocked and tagged Anthony Watts, Bob Carter, Bob Tisdale, climate, climate change, Donna Laframboise, Dr David Evans, global warming, GWPF, Joanne Nova, Marc Morano, Roger Tattersall, Tallbloke's Talkshop, Tony McMichael on September 1, 2014 by tonythomas061.